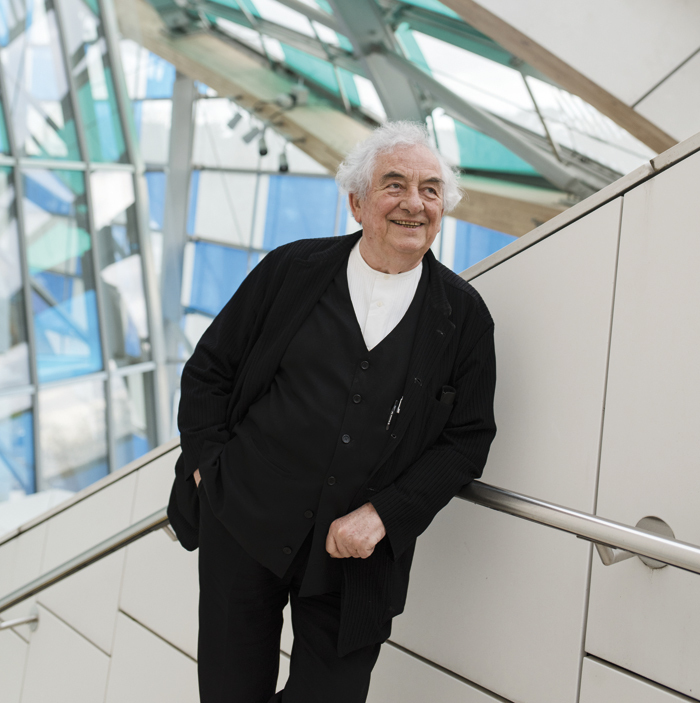 Back in 1965, the French conceptual artist Daniel Buren started making 87mm-wide vertical stripes. These ‘visual tools’, as he calls them, appeared in all sorts of places - first across Paris, then on bus benches in Los Angeles, on placards held up like protest signs in New York, and later on land art in Japan and arches in Casablanca. Now, 51 years after the first stripes, new ones have appeared in Paris. Looking at the vast, colourful, visual spectacle of Buren’s new work that transforms the Fondation Louis Vuitton, the stripes are not immediately obvious. The Frank Gehry building has been a spectacle in its own right ever since it opened in 2014. Buren says his intervention, The Observatory of Light, is a ‘visual challenge’ to the structure, but ‘at the same time, it also respects it’. 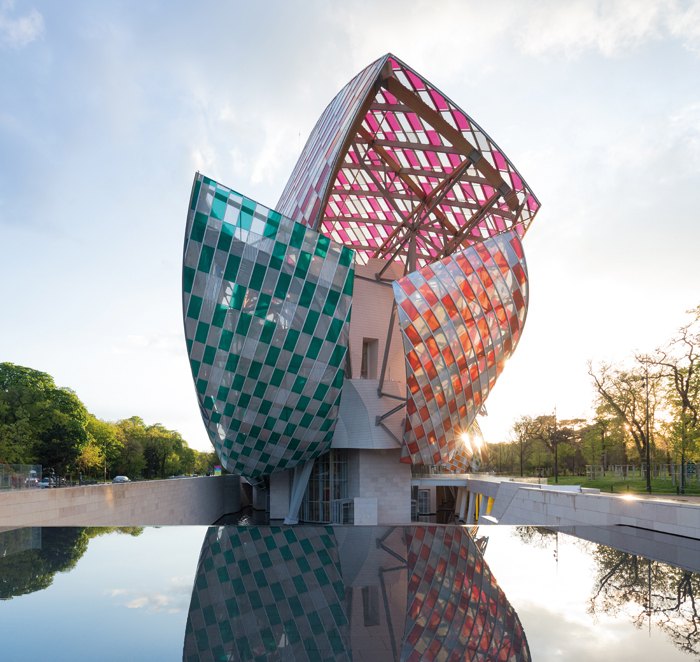 His canvas is Gehry’s huge fluid ensemble of exterior sails, held by a wooden frame and containing 3,600 panes of glass. Each of the 12 sails now carries a harlequin pattern grid of vividly coloured diamonds, which are panes covered by transparent films in 13 colours. Ten sails carry two colours and two of them just one. Buren’s gesture reanimates the ephemeral form, transforming it into a magnificently festive object. But enter the building and Buren’s intervention plays different games. The sails are glimpsed everywhere, hanging outside the lobby like half-drawn curtains, or as an outer bubble beyond windows in gallery floors, or great canopies floating above the high, open terraces, channelling breezes and softening light. That light now diffuses with colour, and gives the very air a celebratory resonance, whatever the season. Glimpses through the sails of La Defense’s distant skyscrapers, or the Bois de Boulogne below, are gift-wrapped in frames of colour. At the opening, Buren wore a black shirt, each button a different colour. He talked of reflections and projections, something he clarified for Blueprint: ‘You have all the colours projected everywhere inside, the feeling of the complete [whole]. It’s mainly the reflection, through the light. The mirror is not just from the outside. The main type of reflection is given by the use of Frank Gehry’s glass, which plays exactly [like] a mirror everywhere’. But what about those stripes? Sure enough, occasional diamond panes are parallel striped in grey, almost hiding among the colour. ‘The visual tool is always vertical,’ Buren says, explaining that despite the curvature and angles, these stripes were meticulously aligned to point down. The veteran provocateur’s work continues to amaze through new forms, but he hasn’t changed his stripes.